When I was in elementary school I used to tell my parents that I always had "the bestest" lunches. While my classmates were having dry peanut butter & jelly sandwiches, Cheetos, and warm milk, I was having steak salad, grapes, and homemade cake. My family wasn't exactly rolling in it, but we always made sure to have great food, first graders included. In fact, I remember being extremely upset my first day of first grade because my mom had packed this amazing lunch into my Strawberry Shortcake lunch box and some stupid girl with the same exact lunch box and an earlier lunchtime ended up taking said amazing lunch and left me with this awful cheese sandwich and a thermos of warm milk. The nerve! Since then we made sure to label everything with my name and I was able to have all of the bestest lunches from there on. 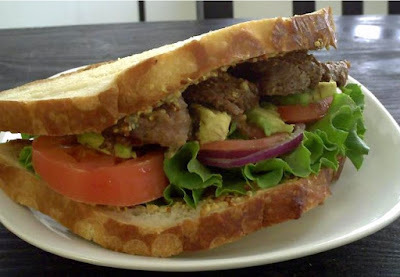 This sandwich is inspired by the steak sandwiches my parents used to make for me. A more grown-up version - with a grammatically correct name, no less - they still taste pretty awesome and make me feel like I'm having something just a tiny bit better than the traditional lunch. Served on grilled sourdough bread with a mountain of veggies, stoneground mustard, these assault the palate with incredible flavors and textures. And yet, they're not all that expensive to make. Something similar to this would run about $9 or more at a restaurant, so to be able to make these at home for about $4 a sandwich is a nice deal. Sure, it's a sandwich that costs a bit more than some of my other recipes, but they're well worth it in my opinion. This is a great way to make use of leftovers, too. Making these after a nice steak dinner, or even making use of those BBQ leftovers further cuts the cost because you're not buying any extra ingredients for it. Don't like sourdough? Any firm, non-sweet bread will be perfect for this. I used a nice tri tip for this, but this would be delicious with quickly cooked flank steak or a nice London Broil. Make your coworkers jealous at lunchtime! Here's the kitchen blueprint for these amazing sandwiches. Lightly season the steak with salt & pepper while warming the grill. Slice the tomato, avocado, and onion. When the grill is ready, cook the steaks as you like them (though these sandwiches are infinitely better if you cook the steaks medium rare). Remove from the grill and allow to cool for a few minutes. In the meantime, lightly butter the bread and grill lightly, or until the bread becomes slightly crispy on the outside. Remove from grill and spread the mustard on each slice. Add the lettuce/greens, onions, tomato, and avocado. Top with thick cuts of steak, some aged cheddar cheese slices if you've got 'em, add the other slice of bread, cut in two for easier handling, and enjoy! Wow, that sounds (and looks!) utterly fantastic. I'm totally buying steak next week (if it's on sale). This looks absolutely delicious. I would love to try this, going to add this to my grocery list for next week! This is LDark on Twitter... I've seriously read almost your entire blog by now! OMG! I just cooked this recipe today. It was scrumptious, I just added some garlic powder to the bread to give it some flavor. 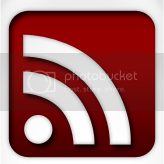 Thax so much, I am now hooked on your blog.